Kwik Kerb® Business Owners undertake comprehensive training to ensure that they can provide the best concrete edging in the business. That is why Kwik Kerb® is the number one brand in the World for domestic concrete kerbing. · Quoting process to ensure you get the kerb and landscape you want. Kwik Kerb® Business Owners offer you a satisfaction guarantee. If you choose a Kwik Certified Kerb® Business Owner as the provider of your concrete landscape edging, you can be assured of a job you will be well satisfied with by a Certified Kwik Kerb Operator, doing everything possible to provide you with the best product available. 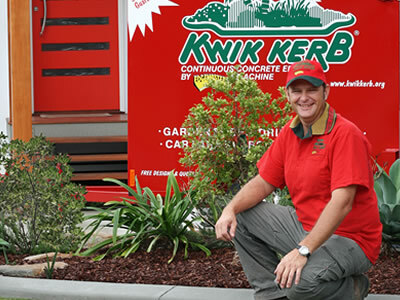 Kwik Kerb® has hundreds of Business Owners around Australia and many more worldwide so chances are Kwik Kerb® is available in your area, please fill in the contact form to have a local operator contact you to set up a time for a free no obligation quote.